Back in the 70s, a double was " cool" and Triples an exotic rumour. That's not my recollection of 80s gearing. If I fond myself with a 34T sprocket I wasn't using, I'd keep the triple and look for a different cassette. Currently running 48/38/28 with a 13-28 cassette (9spd) and it suites that bikes usage fine - YMMV. When I look at CTC photos from that time, there seems to be a lot more walking up hills than I see nowadays, nothing wrong with that of course, unless you're trying to look cool. 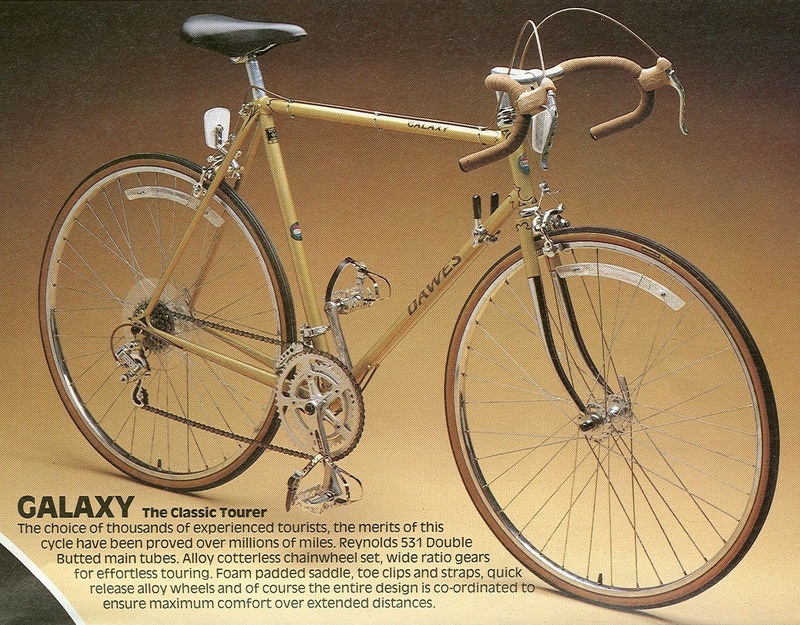 FWIW in mass-produced bikes IIRC the dawes super galaxy has a triple chainset in the early 1980s. I'd be tempted to keep the triple simply because you have more options. If you look at the gears you would be using most of the time with a double, often you would find yourself running cross-chained most of the time. You may not notice this, but it is less efficient; you wouldn't ride around with the brakes rubbing, would you? I can remember when a 46t ring with 5sp 14-24 at the back was your lot. My first double had 46/49 with 14-24. My sis had 46/49 with a 14-28 5sp block but that was seriously touring gearing. A mate ran a single ring (probably 46 or 48) with a 4sp SA hub on which the 1st gear didn't work (he said it was still lower than the 1st on the close -probably medium - ratio SA 3sp that was on his other bike). We used to do YHA week-ends on this kit. Triple and a 32 sprocket - in your dreams maybe! dunno exactly which year this is but the super gal didn't exist before about 1977 (?) and in ~1981 they started using a simpler oval head badge instead of the round one (that was used for most of the 1970s) as above. So this is between 1977 and 1980 most likely. It wasn't every year that a triple was specced either; I have seen super gals from this period that were equipped with a TA double and indeed they reverted to a (much cheaper) double in the oval head badge days. All of a sudden I am 22 planning a trip to Brittany on a Claude Butler Majestique. Because I ruined my knees with decades of cross country running before I discovered bicycles I did my early audax years on my tourers with triples to minimise knee strain but when I thought I was good enough for an proper "audax" bike I was tempted by and drank from the "compact doubles have the range of triples" cup. Only partly true, I give up a lower gear or two but what I really hated was that the gear ratios I used constantly were split across the rings (10 speed 46/30 with 11-36 cassette). So after a not too happy year or so I converted by audax bike to a 9 speed triple just like the tourers and most recently discovered I could make it a 10 speed triple by combining some old bits from the double days (10 speed RH ultegra shifter, XT cassette & chain) with the existing (24-36-48 Sugino cranks, XT RD, Sora triple FD, LH x3 Sora shifter). Works perfectly, the shifters look enough alike to not be offensive at least from where I am sitting, everything shifts well, even better and I can stay most of most rides in the middle ring running up and down the cassette (11-36,) and having 3 good lower ratios on the small ring and 3 higher on the big ring, very happy and very cool. A dubbel for me please. Still the standard double, which is 53/39 nowadays. My first new bike since returning to cycling was a tourer in 2010 which was a triple. Then my first carbon bike (Merckx 69) was a compact double (50/34) in 2015 for PBP, the next three were all 53/39. My gearing on my audax bikes has varied quite a bit. Early on I used 54-42 x 13-26 7sp, just my 700C racing bike with a climbing freewheel. I rode fixed 70"-74" for 3 x SR.
PBP99 was 50-38 x 13-24 7sp on 700C. PBP03 was a Sachs Duomatic hub on 16" wheels, about 71" & 53". PBP07 & 11 were 58-48-34 x 11-24 10sp on 20" wheels. The granny rings weren't needed at PBP but were sometimes essential in other brevets. PBP15 was 46-36-26 x 11-28 8sp on 700C. Everything works in reality. Just some arrangements are a little better than others for a particular rider in a particular time and place. Galaxies had triples in the 70s, I remember a boy in my class had one in 77/78. And this was improved over previous versions; it has DB main tubes where the previous versions had PG main tubes. Forks and stays were pretty basic too; certainly not lightweight. Ironically this may have made the frame a lot stiffer and the bikes better load luggers than more lightweight models. You could easily improve the machine above for pennies; the sun tour gear levers are simple friction ones and whilst they work OK (tip: if you make absolutely sure there is no lash in the capping plate, otherwise they need retightening every ride) the only reason for fitting them is that they are slightly cheaper than the 'powershift' versions. Ditto the seat pin; another obvious sign of penny-pinching. the '1974 machine' clearly dates from the early 1980s too; the head badge didn't come in like that until ~1981. and has a TA double chainset on the super gal. I think they went to 531 forks, lighter stays and brake levers with hoods and no suicide extensions for the next year(or maybe the year after) but kept the double chainset until after that. VCC archive has 1975 cataloguehttp://www.veterancycleclublibrary.org.uk/ncl/pics/Dawes%20catalogue%201975%20(V-CC%20Library).pdf with no super gal at all, and the standard galaxy is still wearing a steel double chainset with cotter pins. including Mirage and double blue models with mavic module E rims and michelin elan tyres; some of the earliest bikes with these 'modern' skinny HP rims/tyres fitted. However they were in 27" size not 700C! 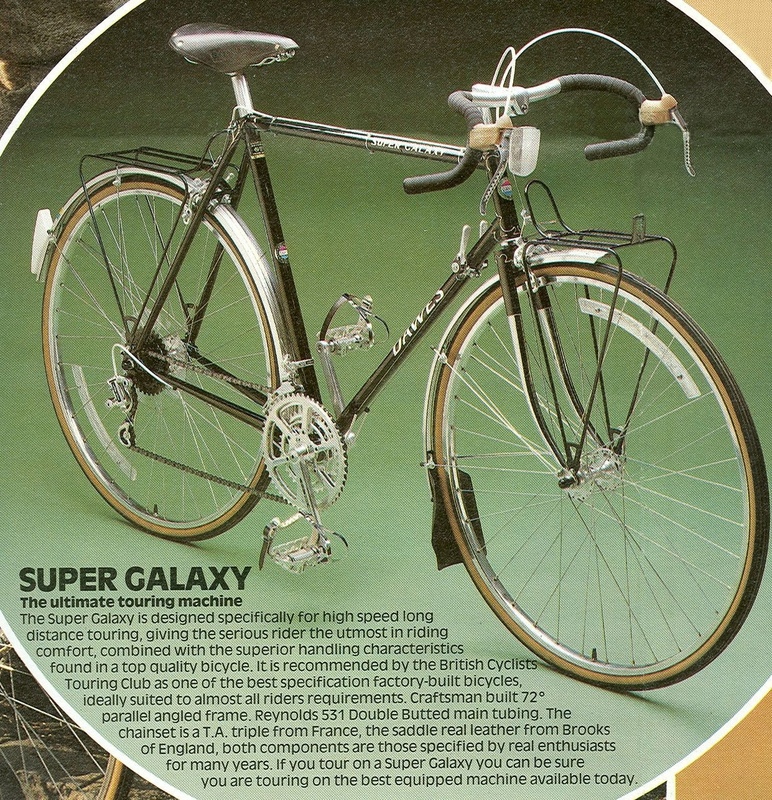 in which the super galaxy has a double chainset, and for that year there is a (new) different top touring model, known as the 'classic' with a triple. I've got one-and-a-half-step plus granny on my tourer. Very wide gear range as suits a recumbent, and those intermediate ratios obtained by shifting front and back in opposite directions occasionally become useful for battling wind in the flatlands. Why stop at 3 or 4? A gear thread... can anyone guess what I'm gonna say? This year, Olive will be mostly wearing, a shiny Stronglight impact triple,( the previous model with 5 fingers of fun), and 48/36/26 , coupled to a retrolopolis 7 speed 13-28 block, and friction bar cons. ...sqweeee!! I'm with you - it's the low gears that matter!